Discussion in 'Released' started by jopojelly, Mar 13, 2016. Cheat Sheet is a tool for developers and those who just want to play around with any vanilla or mod items/recipes/NPC. For now, Cheat Sheet consists of an Item Browser, an NPC Browser, a Recipe Browser , and a special Section where other modders can add their own buttons. The main interaction. Designed to stay discrete and out of the way until needed. Press K (or whatever hotkey you've assigned to "Toggle Cheat Sheet Hotbar") or click the button at the bottom center of your screen to view the Cheat Sheet Hotbar to access all the items. Press/Click again to hide it along with the selected item. Click an item to grab a full stack of that item or Shift-click to move a full stack of that item immediately to your inventory. The category buttons and the search field can be used to filter the list of items. Click any NPC to spawn it in front of your character. Use categories and search filter to find the NPC you desire. Click to reveal a a shelf of tools. Think TEdit or photoshop but in-game. An online database of Schematics submitted by users. Vote up or down. Don't upload a lame schematic or you'll have bad ratings and be unable to submit additional schematics. 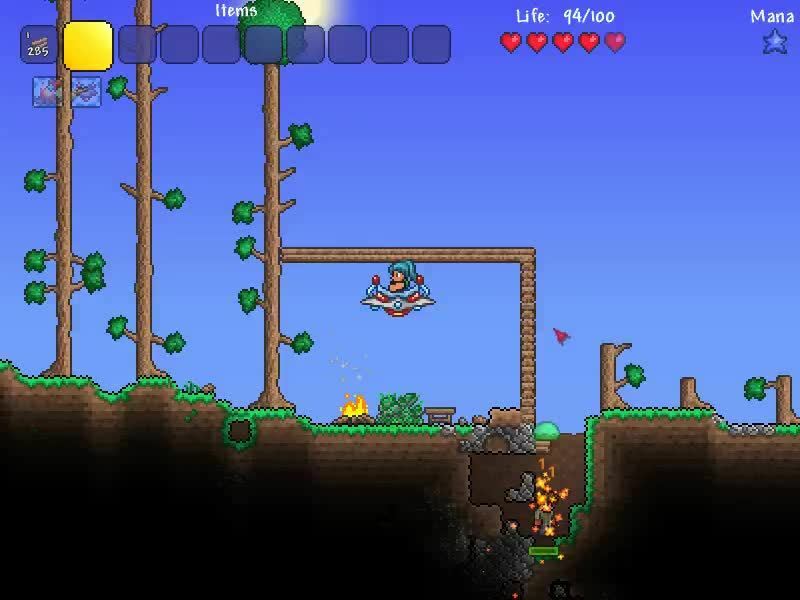 See everything around you without placing torches. Choose between 0 and 6 extra accessory slots. (I know, overkill.) Note that these slots will not have a visual affect on your character. 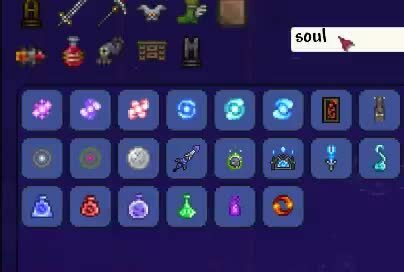 The items in the slots will save with your character. Also note that you can bypass typical accessory limits. More tools will be added over time. Schematics Browser - Click "Load Online Schematics Database" in the Paint tools pallet window. 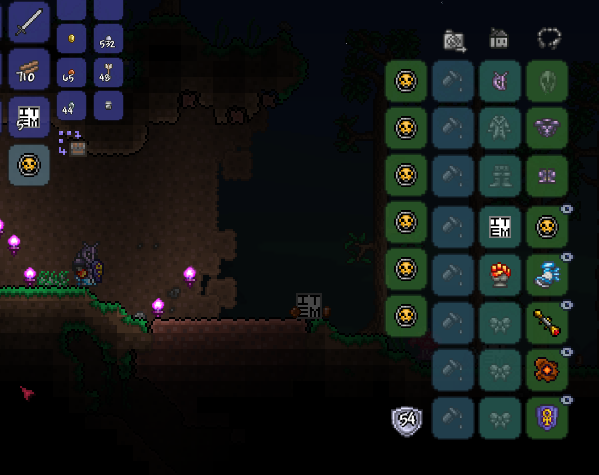 Russian - Thanks "Terraria Phone&PC Team"
Polish, Chinese, Spanish, German, and Italian translations to come with your help! Light Hack tool. See everything without placing torches. Paint Tools now has pallet so you can copy multiple clips, along with other features such as anchor points and export/import functionality. NPC Banner now actually works. It works in MP too. Reverse recipe functionality. Drag items to slot for related recipes. Double click recipe to see next step in crafting tree. Recipe Browser v0.1, a standalone version of just the Recipe tool, released. For those who only want the Recipe tool. Various pause/auto-pause fixes. 1.3.2 fix. Spawn Rate Multiplier Buttons: From half spawns to 30x spawns, have fun. Butcher -- Kill all hostile NPC, town NPC, or both. Quick Clear -- Clear buffs, projectiles, or items from the world. 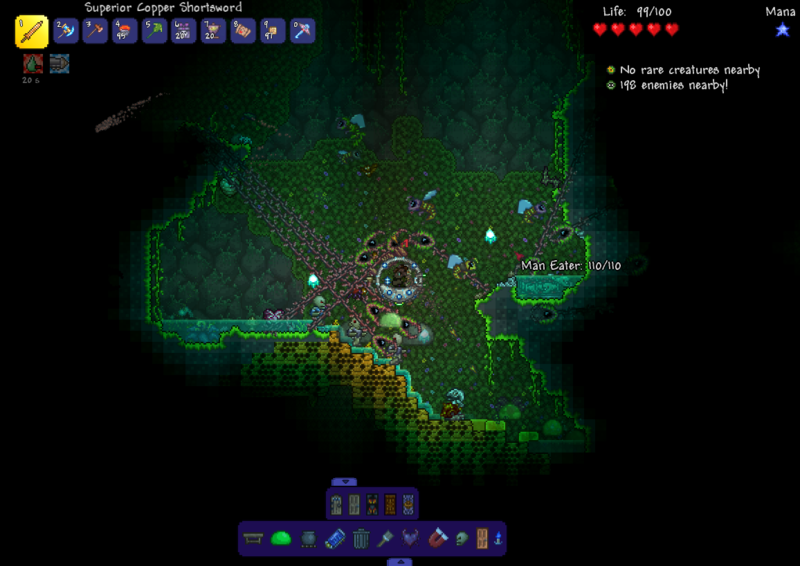 Clear Ground Items and NPC spawner now work in multiplayer. Fixed conflict with Enemy Prefixes mod. Implemented right click. Right click for 1, hold right click for as many as you want. Fixed some hidden stuff too. Huzbubber Tim, Dnarris, esdead and 45 others like this. Error setting value to 'BannedNPCs' on 'CheatSheet.ServerConfiguration'. Mackeye and Daikonradish like this. Yes! YES! Finally somebody made a cheat menu! Great job! P.S. I noticed that modded animated items are not animated in the GUI. It just shows the .png file. Cheat Sheet is a tool for developers and those who just want to play around with any vanilla or mod item. Press K (or whatever hotkey you've assigned) to toggle the Item Browser on and off. Click an item to grab a full stack of that item or Shift-click to move a full stack of that item immediately to your inventory. The category buttons and the search field can be used to filter the list of items. MeMan65, goldenapple and Ashen75 like this. Prefixes in the Item browser. Question, does it have 1.3 stuff? Is it okay if a make a review on this mod? If so, I'll credit you in the description of the video. Wicked awesome mod! Loving these tools, Jopo! What mod had the "Did you hear something... A Volcano! Find cover!" ??? Holy mother of god! Awesome mod! And here comes a question - is it possible to make a mod like Neo's Recipe book? Cheat menu is good but it would be nice to have a mod recipe book so it could be possible to see all the items from mods and their recipes in-game. Oh my god. Yes. 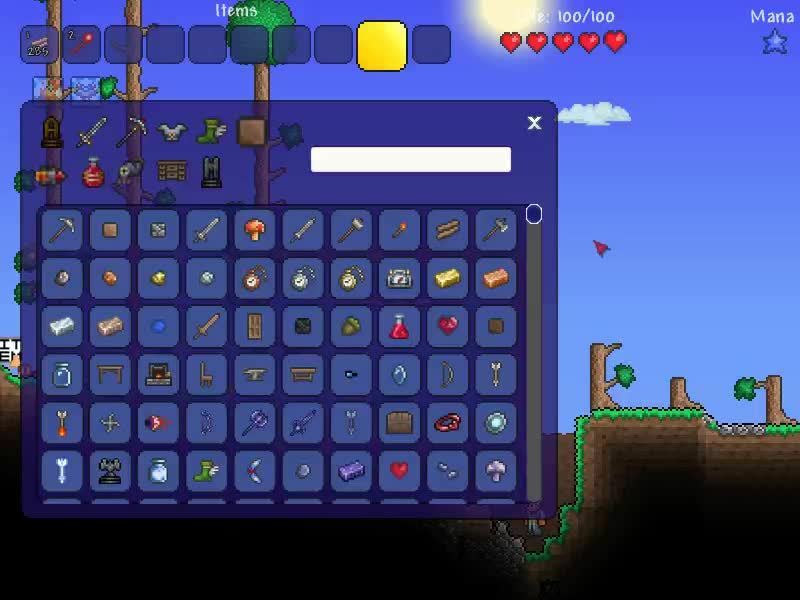 Finally a mod that basically lets me pick and choose things. That'll come in so handy while doing things. Thumbs up for this mod from me! Also I totally can see mod creators and their cheaty items now too. Nvm i figured it out, thank you this will help so much!